Amylase, Protease, Cellulase, Galactohydrolase Lactase, Lipase, Betaine, Pepsin, & Papain. A proprietary blend of Ultra 10x-microfiltered enzymatically hi-absorption whey protein isolate and whey protein concentrate (containing highest levels of bio-active immunoglobulins: Beta-lactoglobulin (55% - 65%), Alpha-lactalalbumin (18%- 25%), Immunoglobulin (9% - 12%), Bovine Serum Albumin (6% - 10%), Lactoferrin (1% - 1.5%), T.A.G. (Trans-Alanyl-Glutamine), Maximum Potency Digestive Enzyme Complex (comprising of Amylase, Protease, Cellulase, Galactohydrolase Lactase, Lipase, Betaine, Pepsin, and Papain), Vitamin Mineral Blend (consisting of Ascorbic Acid, Beta Carotene, Biotin, d-Calcium Pantothenate, Folic Acid, Niacinamide, Pyridoxine Hydrochloride, Riboflavin, Thiamine Mononitrate, Vitamin A Palmitate, Cyanocobalamin, Cholecalciferol, Tocopheryl Acetate, Phytonadione, Chromium, Copper, Calcium, Ferric Orthophosphate, Magnesium Oxide, Manganese Sulfate, Molybdenum, Dipotassium & Dicalcium Phosphate, Potassium Iodide, Selenium, Zinc Oxide), Xanthan Gum, Guar Gum, Natural and Artificial Flavors, Sucralose. Manufactured in a plant that also processes egg, soy, peanut, tree nut, fish, crustaceans/shellfish, and wheat products. A proprietary blend of Ultra 10x-microfiltered enzymatically hi-absorption whey protein isolate and whey protein concentrate (containing highest levels of bio-active immunoglobulins: Beta-lactoglobulin (55% - 65%), Alpha-lactalalbumin (18%- 25%), Immunoglobulin (9% - 12%), Bovine Serum Albumin (6% - 10%), Lactoferrin (1% - 1.5%), T.A.G. (Trans-Alanyl-Glutamine), Maximum Potency Digestive Enzyme Complex (comprising of Betaine, Pepsin, Papain, Amylase), Vitamin Mineral Blend (consisting of Ascorbic Acid, Beta Carotene, Biotin, d-Calcium Pantothenate, Folic Acid, Niacinamide, Pyridoxine Hydrochloride, Riboflavin, Thiamine Mononitrate, Vitamin A Palmitate, Cyanocobalamin, Cholecalciferol, Tocopheryl Acetate, Phytonadione, Chromium, Copper, Calcium, Ferric Orthophosphate, Magnesium Oxide, Manganese Sulfate, Molybdenum, Dipotassium & Dicalcium Phosphate, Potassium Iodide, Selenium, Zinc Oxide), Xanthan Gum, Guar Gum, Natural and Artificial Flavors, Sucralose. A proprietary blend of Ultra 10x-microfiltered enzymatically hi-absorption whey protein isolate and whey protein concentrate (containing highest levels of bio-active immunoglobulins: Beta-lactoglobulin (55% - 65%), Alpha-lactalalbumin (18%- 25%), Immunoglobulin (9% - 12%), Bovine Serum Albumin (6% - 10%), Lactoferrin (1% - 1.5%), T.A.G. (Trans-Alanyl-Glutamine), Maximum Potency Digestive Enzyme Complex (comprising of Amylase, Protease, Cellulase, Galactohydrolase Lactase, Lipase, Betaine, Pepsin, and Papain), Vitamin Mineral Blend (consisting of Ascorbic Acid, Beta Carotene, Biotin, d-Calcium Pantothenate, Folic Acid, Niacinamide, Pyridoxine Hydrochloride, Riboflavin, Thiamine Mononitrate, Vitamin A Palmitate, Cyanocobalamin, Cholecalciferol, Tocopheryl Acetate, Phytonadione, Chromium, Copper, Calcium, Ferric Orthophosphate, Magnesium Oxide, Manganese Sulfate, Molybdenum, Dipotassium & Dicalcium Phosphate, Potassium Iodide, Selenium, Zinc Oxide), Low Fat Cocoa Powder, Lecithin, Xanthan Gum, Guar Gum, Natural and Artificial Flavors, Sucralose. A proprietary blend of Ultra 10x-microfiltered enzymatically hi-absorption whey protein isolate and whey protein concentrate (containing highest levels of bio-active immunoglobulins: Beta-lactoglobulin (55% - 65%), Alpha-lactalalbumin (18%- 25%), Immunoglobulin (9% - 12%), Bovine Serum Albumin (6% - 10%), Lactoferrin (1% - 1.5%), T.A.G. (Trans-Alanyl-Glutamine), Maximum Potency Digestive Enzyme Complex (comprising of Amylase, Protease, Cellulase, Galactohydrolase Lactase, Lipase, Betaine, Pepsin, and Papain), Vitamin Mineral Blend (consisting of Ascorbic Acid, Beta Carotene, Biotin, d-Calcium Pantothenate, Folic Acid, Niacinamide, Pyridoxine Hydrochloride, Riboflavin, Thiamine Mononitrate, Vitamin A Palmitate, Cyanocobalamin, Cholecalciferol, Tocopheryl Acetate, Phytonadione, Chromium, Copper, Calcium, Ferric Orthophosphate, Magnesium Oxide, Manganese Sulfate, Molybdenum, Dipotassium & Dicalcium Phosphate, Potassium Iodide, Selenium, Zinc Oxide), Defatted Reduced-Fat Roasted Peanut Flour, Lecithin, Xanthan Gum, Guar Gum, Natural and Artificial Flavors, Sucralose. Maximum Potency Digestive Enzyme Complex: Amylase, Protease, Cellulase, Galactohydrolase Lactase, Lipase, Betaine, Pepsin, & Papain. Allergen Warning: Manufactured in a plant that also processes egg, soy, peanut, tree nut, fish, curstacean/shellfish and wheat products. A proprietary blend of ultra 10x-microfiltered enzymatically hi-absorption whey protein isolate and whey protein concentrate (containing highest levels of bio-active immunoglobulins: beta-lactoglobulin (55% - 65%), alpha-lactalalbumin (18% - 25%), immunoglubulin (9% - 12%), bovine serum albumin (6% - 10%), lactoferrin (1% - 15%), T.A.G. (trans-alanyl-glutamine), maximum potency digestive enzyme complex (comprising of amylase, protease, cellulase, galactohdyrolase lactase, lipase, betaine, pepsin and papain), vitamin mineral blend (consisting of ascorbic acid, beta carotene, biotin, d-calcium pantothenate, folic acid, niacinamide, pyridoxine hydrochloride, ribofavin, thiamine mononitrate, vitamin A plamitate, cyanocobalamin, cholecalciferol, tocpheryl acetate, phtonadione, chromium, copper, calcium, ferric and dicalcium phosphate, potassium iodide, selenium, zinx oxide), xanthan gum, guar gum, natural and artificial flavors, sucralose. 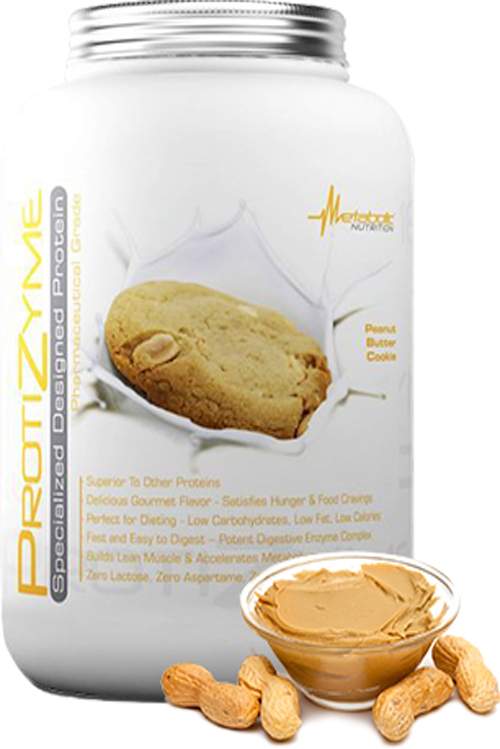 As weight loss solution, add 1-2 scoops of Protizyme to 6-12oz of cold water and mix. For maximum results consume Protizyme 2-3 times daily as a part of your low carbohydrate, low-fat, and reduced calorie diet. As a part of a weightlifting, strength and conditioning routine, add 2-3 scoops of Protizyme to 8-16oz of cold water, milk, or other beverage and mix. For maximum results consume Protizyme 2-3 times daily to meet the high protein nutritional requirements needed for muscle recovery and repair. As a part of an endurance routine, add 1-2 scoops of Protizyme to 6-12 oz of cold water, or other beverage and mix. For maximum results consume Protizyme 1-2 times daily. Use as a primary source of protein and amino acids during exercise and immediately following workouts preventing muscle loss and optimizing lean muscle repair. As part of an optimal health and wellness lifestyle, add 1 scoop of Protizyme to 6-8oz of cold water, milk, or other beverage and mix. For maximum results consume Protizyme 3 times daily; providing a 100% supply of the daily required vitamins and minerals, amino acids, digestive enzymes, and immune-boosting cofactors to your diet. Note: To increase the absorption of other proteins, add 1 serving of Protizyme to any protein powder, weight gainer, and/or meal replacement products to further enhance desired results. Micro-filtered whey protein concentrate, vitamin mineral matrix, cocoa, natural flavors, nutrient stabilizers, sucralose, sodiu chloride, digestive enzyme complex containing amylase, cellulase, lactase, lipase and protease. Take 1-3 scoops up to three times daily. Mix with 5 to 10 oz. of your favorite beverage or prepare healthy high protein meals by combining with your favorite foods. A proprietary blend of Ultra 10x-microfiltered enzymatically hi-absorption whey protein isolate and whey protein concentrate (containing highest levels of bio-active immunoglobulins: Beta-lactoglobulin (55% - 65%), Alpha-lactalalbumin (18% - 25%), Immunoglobulin (9% - 12%), Bovine Serum Albumin (6% - 10%), Lactoferrin (1% - 1.5%), T.A.G. (Trans-Alanyl-Glutamine) Maximum Potency Digestive Enzyme Complex (comprising of Amylase, Protease, Cellulase, Galactohydrolase Lactase, Lipase, Betaine, Pepsin, and Papain), Vitamin Mineral Blend (consisting of Ascorbic Acid, Beta Carotene, Biotin, d-Calcium Pantothenate, Folic Acid, Niacinamide, Pyridoxine Hydrochloride, Riboflavin, Thiamine Mononitrate, Vitamin A Palmitate, Cyanocobalamin, Cholecalciferol, Tocopheryl Acetate, Phytonadione, Chromium, Copper, Calcium, Ferric Orthophosphate, Magnesium Oxide, Manganese Sulfate, Molybdenum, Dipotassium & Dicalcium Phosphate, Potassium Iodide, Selenium, Zinc Oxide), Defatted Reduced-Fat Roasted Peanut Flour, Lecithin, Xanthan Gum, Guar Gum, Natural and Artificial Flavors, Sucralose. A proprietary blend of Ultra 10x-microfiltered Enzymatically Hi-absorption Whey Protein Isolate and Whey Protein Concentrate (containing highest levels of bio-active immunoglobulins: beta-lacotglobulin (55% - 65%), alpha-lactalalbumin (18%-25%), immunoglobulin (9%-12%), bovine serum albumin (6%-10%), lactoferrin (1%-1.5%), T.A.G. (trans-alanyl-glutamine), Maximum Potency Digestive Enzyme Complex (comprising of amylase, protese, cellulse, galactohydrolase lactase, lipase, betaine, pepsin and papain), Vitamin Mineral Blend (consisting of ascorbic acid, beta carotene, biotin, d-calcium pantothenate, folic acid, niacinamide, pyridoxine hydrochloride, riboflavin, thiamine mononitrate, vitamin A palmitate, cyanocobalamin, cholecalciferol, tocopheryl acetate, phyltonadione, chromium, copper, calcium, ferric orthophosphate, magnesium oxide, manganese sulfate, molybedenum, dipotassium & dicalcium phosphate, potassium iodide, selenium, zinc oxide). xanthan gum, guar gum, natural and artificial flavors, sucralose. As a weight loss solution, add 1-2 scoops of Protizyme to 6-12 oz of cold water and mix. For maximum results consume Protizyme 2-3 times daily as a part of your low carbohydrate, low-fat, and reduced calorie diet. As part of a weightlifting, strength and conditioning routine, add 2-3 scoops of Protizyme to 8-16 oz of cold water, milk or other beverage and mix. For maximum results consume Protizyme 2-3 times daily to meet the high protein nutritional requirements needed for muscle recovery and repair. As a part of an endurance routine, add 1-2 scoops of Protizyme to 6-12 oz. of cold water, or other beverage and mix. For maximum results consume Protizyme 1-2 times daily. Use as a primary source of protein and amino acids during exercise and immediately following workouts preventing muscle loss and optimizing lean muscle repair. As part of an optimal health and wellness lifestyle, add 1 scoop of Protizyme to 6-8oz of cold water, milk or other beverage and mix. For maximum results consume Protizyme 3 times daily; providing a 100% supply of the daily required vitamins and minerals, amino acids, digestive enzymes, and immune-boosting cofactors to your diet. Note: To increase the absorption of other proteins, add 1 serving of Protizyme to any protein powder, weight gainer, and/or meal replacement products to further enhance desired results. A proprietary blend of ultra 10x-microfiltered enzymatically hi-absorption whey protein isolate and whey protein concentrate (containing highest levels of bio-active immunoglobulins: beta-lactoglobulin (55% - 65%), alpha-lactalalbumin (18%-25%), immunoglobulin (9%-12%), bovine serum albumin (6%-10%), lactoferrin (1%-1.5%), T.A.G. (trans-alanyl-glutamine), Maximum Potency Digestive Enzyme Complex (comprising of amylase, proteasse, cellulase, galactohydrolase lactase, lipase, betaine, pepsin, and papain), Vitamin Mineral Blend (consisting of ascorbic acid, beta carotene, biotin, d-calcium pantothenate, folic acid, niacinamide, pyridoxine hydrochloride, riboflavin, thiamine mononitrate, vitamin A palmitate, cyanocobalamin, cholecalciferol, tocopheryl acetate, phytonadione, chromium, copper, calcium, ferric orthophosphate, magnesium oxide, manganese sulfate, molybdenum, dipotassium, & dcalcium phosphate, potassium iodide, selenium, zinc oxide), xanthan gum, gur gum, natural and artificial flavors, sucralose. As a weight loss solution, add 1-2 scoops of Protizyme to 6-12 oz of cold water and mix. For maximum results consume Protizyme 2-3 times daily as a part of your low carbohydrate, low-fat, and reduced calorie diet. As a part of a weightlifting, strength and conditioning routine, add 2-3 scoops of Protizyme to 8-16 oz of cold water, milk, or other beverage and mix. For maximum results consume Protizyme 2-3 times daily to meet the high protein nutritional requirements needed for muscle recovery and repair. As a part of an endurance routine, add 1-2 scoops of Protizyme to 6-12 oz of cold water, or other beverage and mix. For maximum results consume Protizyme 1-2 times daily. Use as a primary source of protein and amino acids during exercise and immediately following workouts preventing muscle loss and optimizing lean muscle repair. As part of an optimal health and wellness lifestyle, add 1 scoop of Protizyme to 6-8 oz of cold water, milk, or other beverage and mix. For maximum results consume Protizyme 3 times daily; providing a 100% supply of the daily required vitamins and minerals, amino acids, digestive enzymes, and immune-boosting cofactors to your diet. 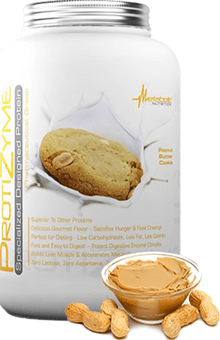 NOTE: To increase the absorption of other proteins, add 1 serving of Protizyme to any protein powder, weight gainer, and/or meal replacement products to further enhance desired results.